In part 1, I explained the background and construction of the Sugino OX601D crankset. 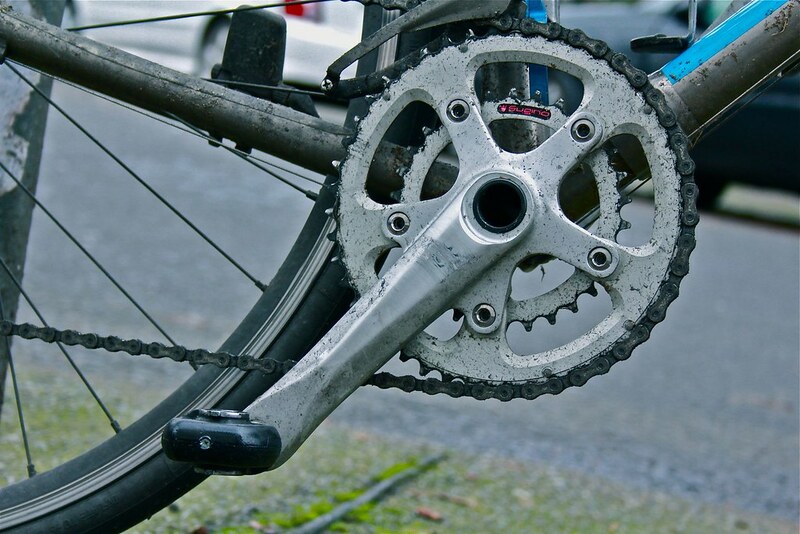 In this segment, I detail my actual experiences using the crankset for the past two months. Out of the box, the OX601D crankset looked a bit nicer than the photos had led me to believe. The matte finish isn’t exactly bling, but I actually prefer it to the slipshod polish of poorly executed components. Anyways, I knew that I would soon be beating the hell out of the crank. The included external bearing bottom bracket is fully interchangeable with Shimano-type versions; it’s seems good but nothing special. The real selling point of this crank is the chainring combo. I went with a typical randonneur’s choice of 46/30T rings. Before I rode them, I was not a little skeptical of their shifting performance. Just because you can put two rings of the desired tooth count beside each other, doesn’t mean that you can make a chain shuttle between them in real world conditions. The big three crankset manufacturers (Campagnolo, SRAM, Shimano) all make chainrings in matched pairs to ensure the shift ramps and pins on the inside face of the big ring precisely line up with the inner ring’s teeth. A manufacturer like TA Specialties makes chainrings with non-optimized pin and ramp placement to theoretically offer flexible ring combinations; however my practical experience with a 44/34 TA combo on a SRAM drivetrain had been exceedingly negative. In order to make my drivetrain raceable in cyclocross, I finally went with a Wick Werkx ring combo. So what would I think of the Sugino rings, seeing as they would necessarily use a non-optimized ramp/pin arrangement? They’re not bad at all. I am not gentle on my equipment, shifting quite aggressively. SRAM front derailleurs/shifters are often considered to be just acceptable compared to Shimano’s, but I felt that even within that system the Sugino rings provided reliable performance in a variety of conditions. The Sugino big ring has ramps that extend far towards the spindle, to accommodate different inner rings. Sugino also provides different sets of chainring spacers based on your ring combo choice, to better match the distance between the rings for the arc of the front derailleur. When installing any crankset with big ring smaller than 50T, you should confirm that you’ll be able to position the front derailleur low enough. 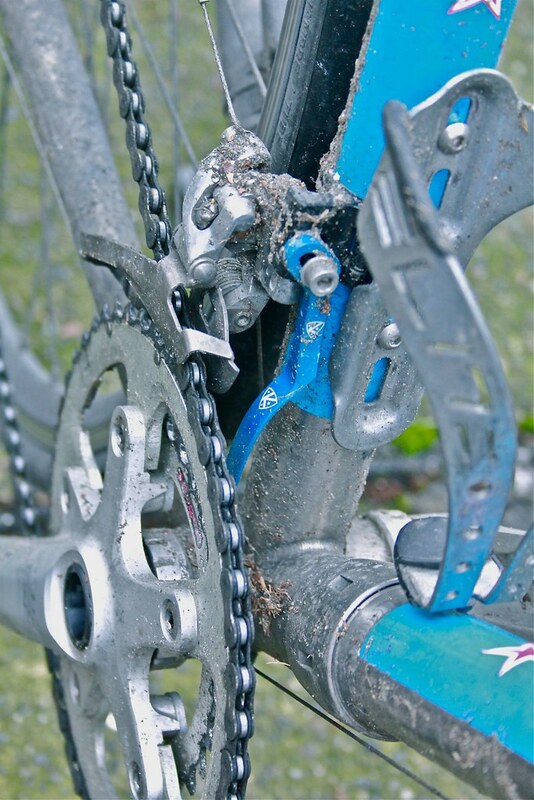 If your bike has a tab to mount the front derailleur, make sure the slot won’t put the front derailleur too high. 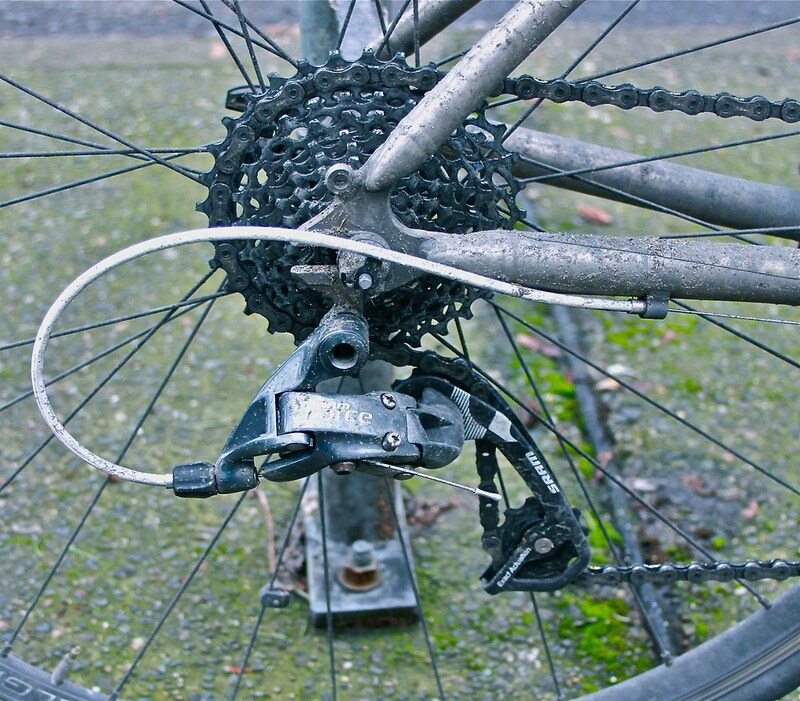 Even bikes with clamp on front derailleurs might have issues such as flared seat tubes or inconveniently placed bottle bosses. A 48T big ring isn’t likely to cause problems, but a 46T or 44T is a little more iffy. My 1990s Italian steel road bike and my carbon Giant TCR won’t work with a 46T big ring, but my titanium S&S bike does. Shifting from the small to big ring, the chain didn’t balk unless I jammed it over at full pressure (and then only occasionally), but even then it would generally catch on the next crank revolution. The front derailleur almost never threw the chain off the outside, but occasionally I’d drop the chain to the inside of the rings if I was on the rear shifter before i had completed a front big-to-small ring shift. Though rare, this would typically come right as I was adjusting for an abruptly steep grade, during which I would have little or no momentum to use while trying to recover the chain. These issues have at least as much to do with the shifting system and fornt derailleur cage shape as it does with the Sugino chainrings. 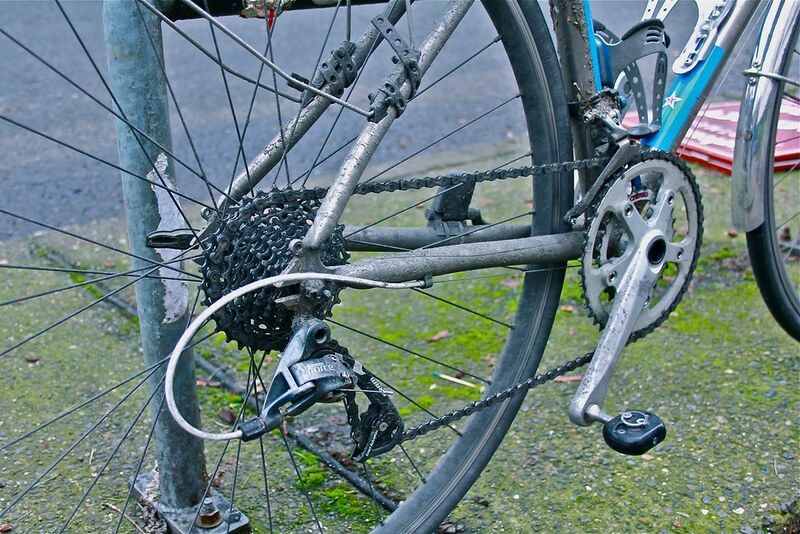 Not a big deal nor frequent hindrance, but since I had a spare K-Edge chain catcher, I installed it. And I never thought about it again. Actually I think K-Edge chain catchers are awesome, having used one on my CX bike for a couple years now, and SRAM integrated the idea into the new-gen Red front derailleurs. Speaking of SRAM, soon after I installed the OX601D crank I paired it up with a SRAM “WiFli” rear drivetrain. WiFli is SRAM’s tritely named concept of combining a wide-range 10sp cassette with a 50/34T compact road crank, but I did it one step further with the Sugino’s 46/30T crank. With an 11-32T cassette, I had a lower than 1:1 bottom gear on the small ring. Of course, on most terrain I could simply leave the chain in the big ring, but that doesn’t make the 30T inner ring redundant nor does it diminish my appreciation of rings’ shifting. I’m a decent road rider who likes to spin. On a sporting ride, I like a 53/39T crank and spend most of my time in the 39. I use the 53T for fast groups and sprints. I don’t like compact road cranks because I can’t just comfortably sit in the 50T or the 34T. Instead I must frequently shift between the two and then make multiple shifts on the rear before I can settle into a ratio I like. With a 46T big ring and 11-32T, I can now sit on the big ring, but I gain a bunch of low gearing for especially low and steep climbs, or if I’ve loaded up my bike. This style of riding is typical of a randonnee, where being able to motor along is key and absolute top speed means little. In the pre-indexed shifting era, cranks like the TA Specialties Cycloctouriste and the Stronglight 49D had provided suitable gearing, but in my experience they are ill-suited for use with integrated shift/brake system, seeing as the old French designs completely lack ramps and pins. The Sugino OX601D (and its more expensively finished OX801D counterpart) are the perfect solution for the randonneur who wants to combine well-proven gearing ratios with up-to-date shifting. In a loaded touring context, I also wish I had this crankset for my fondly-remembered trip across Japan. I would have much preferred the current 46/30 and 11-32 to the 50/39/28 and 12-27 that I had at the time. For one thing, I might not have had the knee issues that flared up during the long grinders in the mountains, because I wouldn’t have had to deal with the wider Q-factor of a triple crank (145mm for the Sugino OX601D vs 156mm for Shimano road triple). In fact, the Sugino crank is a hair narrower than the typical modern crankset (147mm for Dura Ace), though not as narrow as the older French designs. If I had to criticize the Sugino OX601D, I would say that despite reduced costs relative to the OX801D I still can’t quite call the new crank an outright bargain. Japanese-made goods are relatively expensive in a marketplace full of Chinese cookie-cutter product; that’s just a fact. But it is also a fact that no one else offers what Sugino does: modern shift system compatibility, external bearing BB, narrow q-factor, and inner rings smaller than 34T on a double crank. Still, while the “Compact Plus” spider pattern does offer flexibility for chainring combos, it occurred to me that perhaps the same combos could have been more elegantly provided by using a smaller bdc for both ring positions. The five arm 94mm bcd (combined with a 58mm bcd granny) was a common pattern in the mid to latter 1990s; however that would have limited the inner ring to 29T. Further, though the 50/34T combo is well provided by other venders, it would be foolish for Sugino to shun it. And the 110mm bcd is arguably the best option for that combo. It is worth noting that a mtb version of the Sugino crank exists (with a wider chainline and q-factor) that caters to 2 x 10 drivetrains, and an inner chainring option smaller than 29T is highly desirable. In a similar manner to Sugino, SRAM uses 2 different bcds for their current mtb double cranks. The Sugino OX601D retails for $399 complete with BB directly from Soma. Or your local bike shop or custom builder can procure them from the Merry Sales Company. Chainring options currently include 30-36T inner rings and outer rings 44-50T. For the best shifting with modern drivetrains, I recommend that you choose a combination with a difference no greater than 16 teeth.